Facebook via mobile apps has become a massive platform unto itself, according to the latest calculations from UK analyst Benedict Evans of Enders Analysis. Using Facebook figures and its own models, the company believes that more than 300 million people were accessing Facebook via their smartphone apps this month. Facebook itself declared in September that more than 350 million of its 800 million users were connecting to the service over mobile handsets, although that included mobile Web and feature phone access. Facebook does not say what share of users are now mobile-only. According to Evans’ take on usage on Dec. 27, just over 100 million iPhone and iPod Touch owners are accessing Facebook monthly through their apps, with 87.8 million coming from Android phones. On a daily basis, however, the Google operating system edges out iPhone/iPod Touch, with 59.7 million Facebook app users vs. 58.4 million for Apple handhelds. 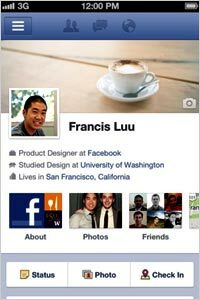 In all, he estimates that 30% of all Facebook members are using smartphone apps to log in. As maligned as the RIM BlackBerry OS has been this year, as its market share continues to erode, the platform remains strong on Facebook. On a monthly basis, 48.3 million BlackBerry users are accessing the social network -- 30.1 million daily. Evans points out that RIM has a higher Facebook penetration rate among its users than other operating systems. About 70% of BlackBerry users have installed the app, compared to only about half of iOS and Android users. Evans points out that Facebook now has a smartphone app platform that is larger than either Apple or Android’s respective installed bases. As the company unites the experience under a common HTML5 model, the two apps will become merely wrappers for the same app experience and a massive platform on which to serve advertising and promotions. “Next year Facebook will treat that user base as less of a mobile extension to the desktop experience and more as the core product -- starting with advertising,” he says.